Hooray for the arrival of April and hopefully some consistent warm spring weather is here to stay! It's time for another Color Throwdown Challenge and Lori is hosting this week. 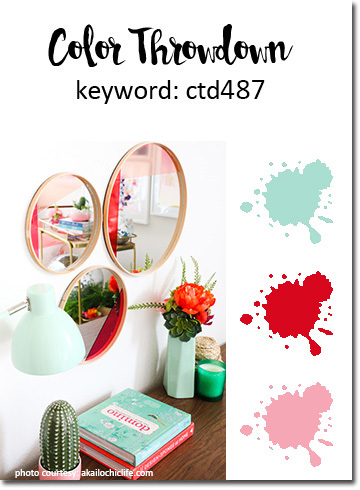 She has chosen a beautiful color combo of mint, pink and red! I dug into my retired stash of SU cardstock to use this Mint Melody color that retired a LONG time ago. PAPER: Mint Melody, Real Red, Pretty in Pink - SU; White card base - PTI; Textured White (tag) - ? source. INK: Seafoam (Reverse Confetti) to sponge edges of leaves. DIES: Fancy Words (Reverse Confetti); Fantasy Floral Die (Altenew); Tag Die-Namics by MFT. MISC. : Red twine, Brights dots by SU. We are thrilled to announce that our guest designer for the month of April is Hannelie Bester of the Desert Diva blog! 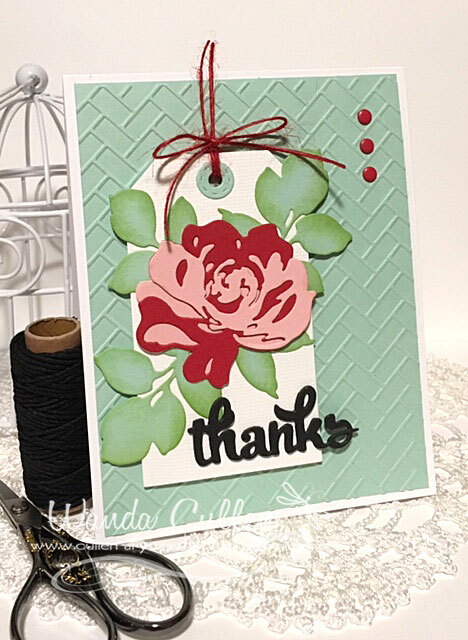 She is one of the most talented CAS card designers and I've been a fan of hers for a long time! You don't want to miss her gorgeous sample for the colors this week!